The Day the Earth Stood Still (1951) stands out as one of the all time great science fiction flicks. In 1951 the fear of a nuclear world war was something on the minds of many americans. While the movie dealt with an alien invasion, the heaver theme was that the aliens tell the people of Earth that they must live peacefully or be destroyed as a danger to other planets. We really can't be trusted with all those nuclear weapons! The movie begins with a space ship landing in Washington, DC. The alien Klaatu emerges from the ship announcing that he has come from outer space on a goodwill mission. As Klaatu explains his mission he takes out and opens a small device. An uptight trigger happy soldier with his gun pointed at Klaatu takes a shot and wounds him. In response to the shooting a large humanoid robot emerges from the ship and begins disintegrating the weapons surrounding them. Klaatu orders the robot Gort to stop.Klaatu explains to the soldiers that the object they destroyed was a gift for the President. 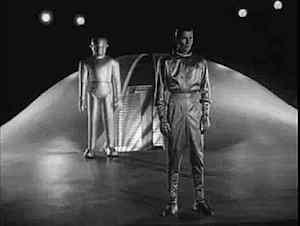 Klaatu is taken into custody as the robot Gort stand guard on the alien ship. In a mantra that I repeat often, good science fiction is about good characters, not good special effects. The movie is not over the top sci-fi in terms of alien make up and effects. Other than the robot and the space ship there is not much here in terms of special effects. The alien Klaatu is in human form. The plot is wrapped around human nature, and human paranoia. The drama here is between the characters. The alien Klaatu tells his human friend in that movie that should anything to happen to him, she must say the phrase to the robot Gort, "Klaatu barada nikto." Since the release of the movie, the phrase "Klaatu barada nikto" has appeared repeatedly in fiction and in popular culture. The Robot Hall of Fame described it as "one of the most famous commands in science fiction." The Day the Earth Stood Still (2008) is as opposite in everyway as it could be from the original. The major change in plot from TDTESS 1951 and 2008 is what we are about to do to destroy the earth. In 1951 it was nuclear war, in 2008 it is global warming. In the The Day the Earth Stood Still, 1951 version, the characters play well together, they feel real, there is real drama in the dialogue. In both versions, the main human character is Helen Benson, a widow with a young son. In the 2008 version the young single mother has a very bitter and angry step son who is mad at the world for loosing his father in the war. The son's constant attitude issues distract more from the original story than add to it. Maybe the added social commentary this movie is trying to teach us is that children of deceased war veterans are selfish, self-centered brats? Another interesting change, in the 1951 movie the aliens land in Washington, DC. In the 2008 version, as it seems to be the case in most modern movies, the aliens now seem to target New York City. It is a popular Hollywood fad, the franchise reboot, where a new team of writers and producers develop new material using well known themes and characters, without regard for the existing fictional world or timeline already established in previous movies. It amazed me how you could take essentially the same plot as the 1951 movie, and make such an incredibly dull movie.